In nutrition, consistency is everything. Here's how Chris Thompson mastered his macros and made a fail-proof program for himself. Chris Thompson doesn't program hop or mess around with fad diets. He knows exactly what macronutrient ratio works best for him and his goals, and he sticks to it. It's his consistent dedication to making healthy choices that has turned his body into well-muscled machine that any guy—regardless of his age—would admire. Much of the success Chris has found with his training is a product of his diet. "I'm super consistent," he says. "I don't cheat; I don't fail. Diet is an important part of that 'perfect practice makes perfection' idea that I live by." The number of meals that I eat each day depends entirely on what my body tells me. Chris's diet is based upon a specific macronutrient break down. "I eat 45 grams of protein, 40 grams of carbohydrates, and 17 grams of fat per meal," he says. His carbohydrates are almost exclusively from vegetables, and his fat sources are oil-based. "I like to use mostly coconut, but I also use olive oil or walnut oil. When I'm traveling, I'll eat walnuts." "The number of meals that I eat each day depends entirely on what my body tells me. One day can be 3-4 meals, and other days that can be 5 or 6 or 7. What I really like about that plan is that it's helped me find balance. With all the craziness and difficulty that's in my life already, it's really helpful to have something constant." The only time Chris changes his macronutrient ratio is when he's prepping for an event. "If I'm preparing for something, then I lower my carbs," he says. "Other than those rare changes, the most important part of my nutrition plan is to stick to that ratio." "I've kind of gotten addicted, if you will, to feeling good," says Chris. His healthy diet doesn't just make his physique look great, it keeps him healthy. "It's kind of funny that a lot of people get into fitness for health, especially later in life because their doctor tells them to clean up their diet. I changed how I eat for aesthetic purposes, and it had an awesome effect on my wellness. My doctor said, 'Wow, your blood chemistry and blood pressure are fantastic.' That's a great thing to hear, but I mainly keep eating the way I do because it makes me feel good, which is important when you have a hectic, challenging life." Chris says his first meal is often his favorite. 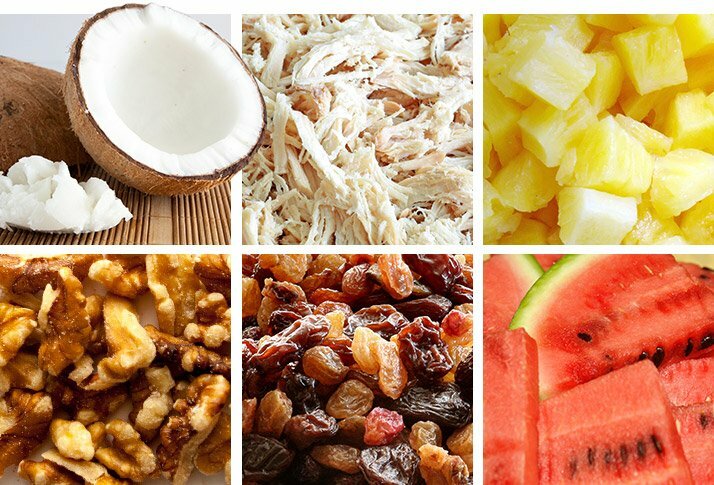 "I usually eat a scramble of egg whites, banana, raisins, walnuts, and Splenda. Or, I like to start the day with cottage cheese and fruit and then have a little bit of coconut oil." From there, Thompson's day becomes less typical. "I like using a Crockpot and slow-cooking chicken in bulk until it falls apart and gets shredded—just like I want to be. I also like to put hot sauce on everything. One of my favorite on-the-go meals is chicken, olive oil, and raisins. I get my 45 grams of protein from the chicken, my 17 grams of fat from the olive oil, and my 40 grams of carbs from the raisins. It hits my macros and it's easy to take along with me wherever I go." Despite tight macros, Chris also likes to include some of his favorite foods on a daily basis. "I eat watermelon and pineapple almost every day. I haven't always been such a fruit fan, but I've found that it's helped satisfy cravings so I don't really ever need a sugar fix." Chris has found that sticking to his macros with a diverse array of nutrient-dense foods is best for his health and physique. "Really, I eat whatever mixes of food I want to," he says. "I just make sure that every meal hits the same macros. Thanks to this plan, I never feel the need to cheat, I never feel bored, and my body always feels great."